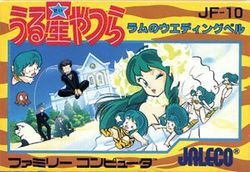 Urusei Yatsura: Lum no Wedding Bell is a Nintendo Famicom platform game developed by Jaleco and released in 1986. It is a port of Momoko 120%, an arcade game released the same year. This port is based on the manga Urusei Yatsura, where the player controls Lum as she grows up and has to avoid alien invaders while trying to reach her rescue UFO. The player starts out at infant school, then works her way to elementary school, junior high school, high school, college, and finally the player gets married to a bridegroom in a white tuxedo. After that, the game starts over again. Urusei Yatsura, also known as "Lum, the Invader Girl", or "Those Obnoxious Aliens", is a well-known late 70s to 80s manga (1978–1987) and anime (1981–1986) series created by Rumiko Takahashi. The manga received the Shogakukan Manga Award in 1981. The anime version originally premiered across Japan on the Fuji Television network between 1981-1986. The original title is a Japanese pun, and roughly translates as "those obnoxious aliens". The word urusei is a crude way of saying urusai, which means "noisy" or "obnoxious", and is also a slang phrase for "shut up!" The second word in the title, yatsura, is the plural form of yatsu (奴), the low-respect pronoun for "the person over there" and carrying the connotation of a hooligan or jerk. However, the kanji for star/planet (星) is used; hence, the title can be seen as an untranslatable combination of "Those noisy hooligans" and "Those jerks from the planet Uru". Uru is the name of the planet from which Lum, Ran, Benten and the other alien characters originate. The series is very light-hearted in nature and often quite bizarre. It concerns the adventures of a group of teenagers who live in Tomobiki, an area of the Nerima ward of Tokyo on a slightly fantastical and often ridiculously surreal version of Earth. The story centers around an extremely lecherous and very unlucky high-school boy, Ataru Moroboshi, and the bikini clad alien princess Lum. Lum is in love with Ataru because he accidentally proposed to her, even though he chases after every humanoid female other than Lum. (He lost interest in her as soon as she started chasing him, and also probably because she uses her powers on him many times, which come in the form of electric shocks.) The series is mainly episodic, with only occasional plots spanning more than one chapter/episode. Each of these usually concerns Ataru's ill-luck, his lechery (and Lum's jealousy thereof) or the wide variety of weird humans and aliens who love, hate, or simply meddle with Lum and Ataru. Power up items are hidden throughout each of the stages. They are hidden from sight, and you must jump into the air to make them appear, and jump a second time to collect them. These items will always be found in the same place, so once you find one, remember its location for the next game. For each item you collect, the "I" counter at the top of the screen will increase by one. If your "I" counter reaches 2, any item that you collect next will summon Lum's ex-fiancé Rei, rather than providing you with the usual effect. It will also reset the "I" counter to zero. Alien Collect the Dappya fish alien to earn 5000 bonus points. It will resemble a man in a spacesuit. Bird If you collect the bird, Lum's usual tiger bathing suit will be replaced with a uniform that conforms to her surroundings (such as a school uniform). Possessing a suit will provided you with protection from one hit. If you get hit, your uniform will begin to blink. During this time, you are invulnerable until the uniform disappears completely. If you complete the stage in your uniform, you will continue to possess the uniform in the next stage. Katana Once you touch the Katana, Shutaro Mendou will appear and to protect you. He will run slightly ahead of you, destroying any enemy that touches him. He will remain with you for 30 second, or until to rise to a new floor. You can't reveal any power ups while Mendou is present. Kitsune These little white foxes will grant Lum access to a bonus game. In this game, you must shoot all of the birds flying around the screen. Lum can fly in this room by tapping the A button. If you destroy them all, you will be granted bonus points for any remaining time. Onsen Mark This appears as a circle with waves rising from it, a symbol commonly used in Japan to indicate hot springs. This symbol is also seen on the back of the jacket of one of Lum's teachers. Touch it to make this teacher appear and absorb all the damage from enemy attacks. You can't reveal any power ups while the teacher is present. Rubber Duck Collect this duck to summon Lum's young cousin, Jariten. While present, Jariten will hover over Lum and shoot fireballs down at the ground. He will eventually leave, but while he's present, you can't reveal any power ups. Star When you collect the star, Lum charges her body with electricity. After doing so, she will be invincible for around 30 seconds. She cannot destroy enemies just by touching them, but she can continue to kill them by shooting them. Lum can still die if she falls or if the fire catches her. Rei: Whenever you collect an item after you "I" counter has reached 2, Lum disappears and is replaced by Rei, an ex-fiancé of Lum's who travels to earth to win her back. Rei has the ability to transform into an "ushitora," a huge, fat creature resembling a cross between a tiger and a bull. Every enemy will transform into a taiyaki, a type of sweet-filled baked good shaped like a fish. Rei will eat these taiyaki for bonus points. Rei will never fall down from any floor, and he can even rise to higher floors by pushing up while jumping after eating a number of taiyaki. Rei can not reveal power up items, and the one you collected to make Rei appear will not have its usual effect. However, Rei can find and activate switches. The screen flashes while Rei is present, but the flashing will die down as Rei is about to disappear. This page was last edited on 14 March 2012, at 10:55.